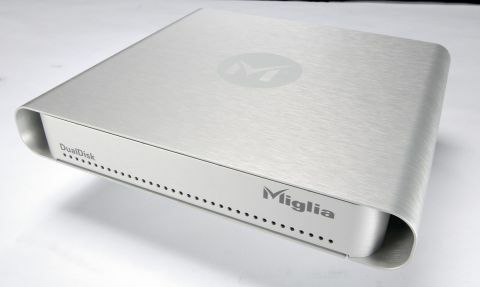 Can it really have taken Miglia two years to find a replacement housing for its much-lamented dual hard drive? Still, the wait was worth it. The brushed-aluminium case of this DualDisk complements a G5 perfectly. It houses two IDE drives for a 320GB or 500GB hard drive. The unit we tested housed twin 160MB Maxtor IDE drives with an 8MB cache and a 7,200RPM spin speed, bridged to a FireWire 800 interface. The DualDisk draws its power from a small transformer brick that utilises the three-cloverleaf mains lead. The supply attaches to the casing via a 5-pin DIN plug, and two FireWire 800 ports on the rear provide an essential daisy-chaining facility. The only other control is a small rocker switch for turning the unit on and off. There are no indicator lights to show either drive activity or whether the unit is connected to the mains. However, the roar of the cooling fan is loud enough to let you know when the unit is active. Transfer speeds are stunning. Our benchmarks recorded an average speed of 45Mbps and a peak speed of 100Mbps. In our real-world test the drive was only slightly slower than the SeriTek SATA housing we were testing alongside it. Our folder of test files was 2.6GB and transferred in 68 seconds. However, we do have an issue with the loudness of the small cooling fan, which would be unacceptable in a small room. The lack of a vertical mounting stand also makes it a bit of a desk hog; the rounded edges make it impossible for the unit to stand on its side.